Friday Funny – The Global Warming Escalator -vs- The Rocket | Watts Up With That? Many WUWT readers have seen the famous bit of propaganda produced by John Cook at the antithetically named “Skeptical Science” website, where he creates a series of steps along the graph of global temperatures suggesting that every time climate skeptics see a “pause” they claim global cooling. Of course, that’s nonsense, but for Cook, it has propaganda value much like his 97% consensus meme which is now falling apart. The problem with The Escalator from “Skeptical Science”, is that it doesn’t show the alarmist favored view of temperature rise, for example, these IPCC projections from the Third Assessment Report that rocket skyward. Here at WUWT, we are happy to help with a new, more humorous visualization of “The Escalator”, which I call “The Rocket”. Note: Some readers in comments apparently are just too serious, and miss the humor and satire tags along with the headline. Just laugh, it’s funny. When we get claims like “the oceans will boil” and temperature rises of 6C by the end of the century all you can do is make fun of it. May 31, 2013 in Climate data, Humor, IPCC, Satire. What happens to the rocketscalator if you broaden the time frame to start in 1850 or 1650? Bob, the graph doesn’t need to show those years. Look at the Date ranges. 1970 is when all “hell” broke loose. This is a good graph showing the truth. Also, looks like things are off about a factor of 10 on the temp side. The scam is they always use the start year as 1970s. If they change the start year to 1940s they get a completely different result. They get only half the warming rate. I suggest everyone should look very carefully at how well the “alarmist” red line fits in the IPCC result in the previous figure. Given the different scales it isn’t easy, which I suspect is intentional, but the line is highly misleading. Perhaps Anthony could make a new attempt based on the real IPCC-data? The flat line before 1970 is especially amusing. Gentlemen, your models know sh*t about real climate. Good point Bob, I always ask those folks from SKS why the graph starts in the coldest decade of the last century and runs through one of the hottest…of course, these people think we never had a storm north of the Mason-Dixon line before Sandy…. Well it might have something to do with the most recent decade being the hottest and the anti-reality crowd starting up their nonsense around the early 80’s. Ya gotta love that escacherrypickalotor. Unfortunately for them, even with C02 levels (supposedly) reaching the highest levels in some 800k years, temps have been flat for the past 17 years now. So, they are stuck inventing “reasons” why temps have been flat, and continually moving the goalposts. Well it might have something to do with the most recent decade being the hottest and the anti-reality crowd starting up their nonsense around the early 80′s. Warmth is what you get when the earth pulls out of a Little Ice Age. Thank goodness, too! Juraj V. Another troll with a degree in excrement? Well, lefty Tend to be behind the times. It’s not so foolish if you still living in the 20th century. In other words, you say that before 1970 temperatures changed only by +- 0.1 deg C, as the IPCC models seem to suggest? Did they really have that graph in their report? That’s pretty barmy, even for IPCC programmers. 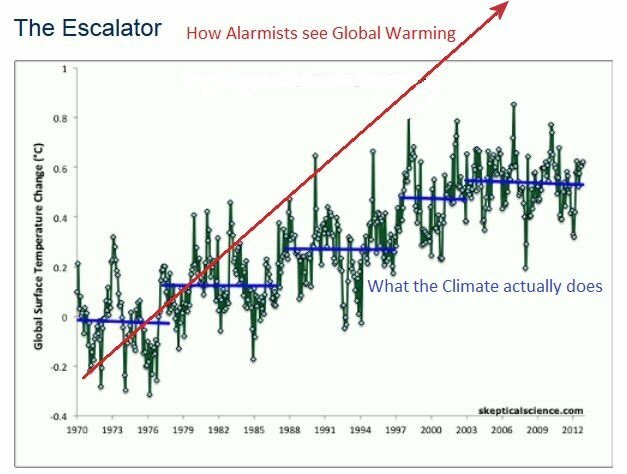 In my opinion, blue lines are alarmists’ notion of what skeptics see, and the red line is the skeptics’ notion of what alarmists see. I’d definitely not call the blue part “what Climate actually does” because not just the blue line but even the green line is not what climate actually does. Things are way more complicated than that. What always struck me about the “escalator” was that the most recent pause is the longest that SKS shows in their plot and this is when CO2 in the atmosphere is growing the fastest. If CO2 had anything to do with it shouldn’t it be just the opposite? If you put this escalator over the past 2,000 years, you’ll see a very pretty up and down wave. With two times even warmer than today. From the graph, I cant see. Is this global or just northern hemisphere? I can seen the “70’s cooling” period has been largely “smoothed out” (Heh! ), so not a surprise that 80’s it a bit warmer, apart from the mid-80’s bitter winters. But 2-4c increase, doubt it! (Oh dear another Sks fail?). By eye it looks like the red line increases about 0.8oC between 1970 and 1990, that’s about 0.4oC per decade. From memory that’s actually twice the rate of warming than the IPCC expect. You need to go back and adjust the red line to give a more reasonable comparison. 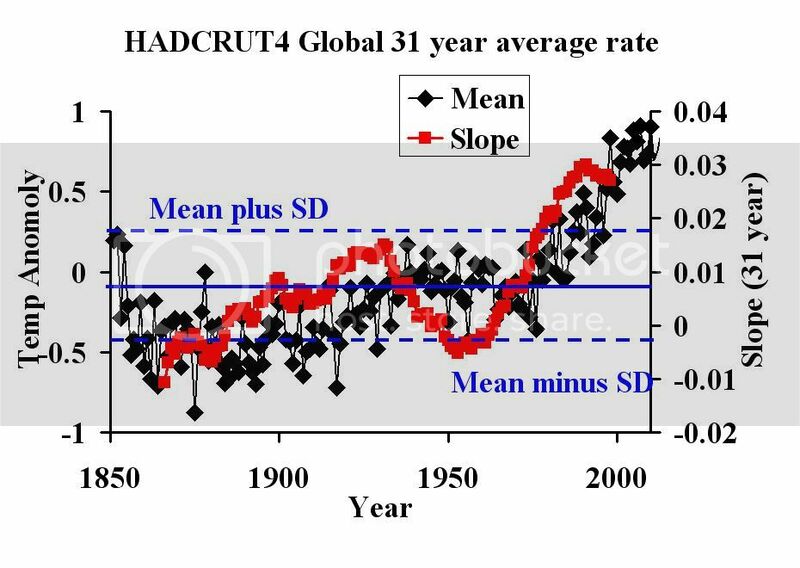 It would be nice if you pasted the HADCRUT4 Global annual temperature on the first figure. The lack of signal between 1850 and 1970 is completely bogus. It shows rather nicely the slowing of the RATE of temperature increase. Look at the first graph. In 1970 the temp anomoly is >0 (say about 0.2oC). By 2000 it’s <1 (say about 0.6oC). Your added red line suggests "alarmists" believe the temp should have increased by 1.2oC in that time. The first graph shows this is clearly not the case. THIS IS A FAIL. If warming from CO2 was instant or rapid, yes. But it’s quite gradual. Even more gradual than that red line suggests it should be. A little bit off-topic, but did you notice that, according to GISS, five of the six coldest winters in the last 12 years have happened in the last 6 years? That looks like a clear down trend to me, at least WRT winter temperatures (December + January + February). “Look at the first graph. In 1970 the temp anomoly is >0 (say about 0.2oC). By 2000 it’s <1 (say about 0.6oC). Your added red line suggests "alarmists" believe the temp should have increased by 1.2oC in that time. The first graph shows this is clearly not the case. THIS IS A FAIL." While this is true, he at least had the courtesy to tag it as humor/satire this time. Though the commenters seem to be unaware of that point…. Ryan he’s also tagged it ‘climate data’. But it’s neither climate data nor humour. it’s bad maths. I suspect Cook’s escelator will never admit a down step. Instead, the start point for the final stair will just slide backward. JAXA looks interesting so far. I suspect we’re all waiting to get past the point of last year’s sudden drop before pointing it out. 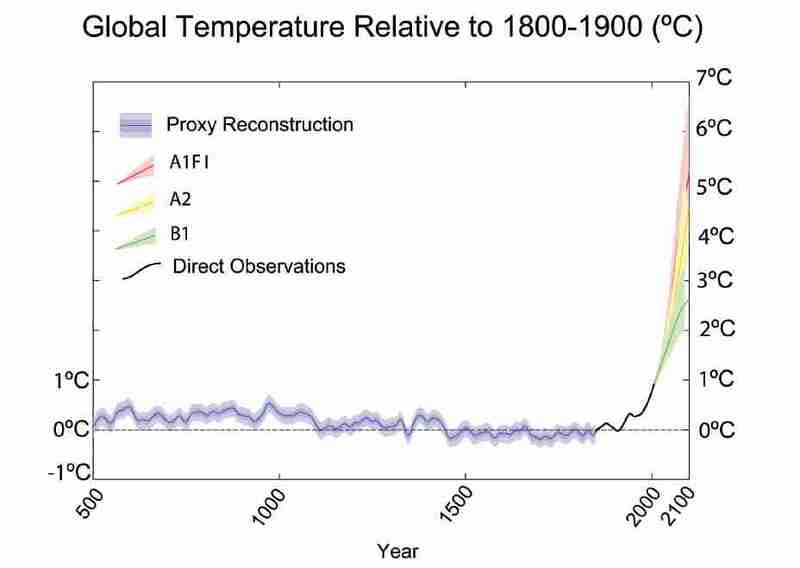 Interesting that 1936 was hotter than 1998 and yet it hardly lifts off the abscissa of the IPCC graph. Actually, Ryan, your “C02 warming” hasn’t gone beyond the conjecture stage. In fact, the modern warming is well within the bounds of natural warming. But then, you live in the CAGW fantasy world, so can’t be expected to understand that, I guess. Ryan, do you truely believe that last decade is one of the hotest? Paleo-climate data points to a much different scenario. Still hoping that the models will be vindicated? Forget it. They're useless junk. The last trend line is much longer than the other ones. SkS doesn’t see that as significant? The first graph in this article does indeed give an accurate account of the “alarmist” view. Take a close look at what that graph shows between 1970 and 2000. It shows a temperature increase of about 0.5 degrees C.
Now take a close look at the second graph. The red line purports to show us “How Alarmists See Global Warming.” That line shows an increase of 1.2 degrees C from 1970 to 2000. That is clearly not what is shown in the first IPCC generated (alarmist) graph. So it appears to me that the red line in the second graph is a strawman that does not really represent the views of most alramists. It is possible that there is some alarmist claim that the temperature rose by 1.2 degrees C from 1970 to 2000 from some source unknown to me. If that claim is common among alarmists, and a reference can be provided, them I will retract my assertion that the red line in the second graph is a strawman that misrepresents the views of the alarmists. Does it bother you when alarmists make the strawman claim that skeptics believe that CO2 is not a greenhous gas? Does it bother you when alarmists make the strawman claim that skeptics believe that there has been no warming in the last 100 years? What is the slope of the red line based on? 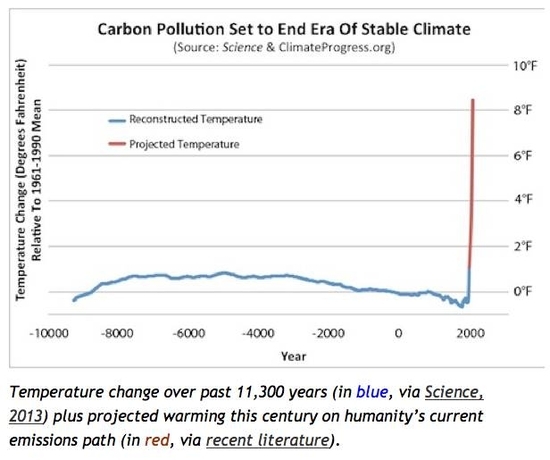 I know it’s a Friday funny, but is the red line based on an older IPCC report? If so, that’s fine, but just label it that way or mention it in the text. Instant or rapid has nothing to do with it. If it is slow, that just means that the temperature correlates to an earlier part of the exponentially increasing CO2 curve. So the most recent temperature increase should still be caused by the highest and fastest changing part of the CO2 curve that is currently having a temperature effect. Maybe a little extreme: from 1970 (-0.275C) to 2000 (1.0C) amounts to 4.25C/century. OTOH: The warmists claim they want to stop a 2C growth, but I can’t figure out if that is 2C from 1850 or from 1988. I think it goes back and forth depending on whether the speaker is full-on CAGW or just AGW. What makes you think that? All I’ve said is the trend on the red line in incorrectly calculated. John Cook’s graph of planetary temperature is the GISS adjusted temperature data set. The GISS global temperature anomaly is roughly 0.3C higher than the UAH satellite global temperature anomaly. There is a reason NOAA does not use the NASA satellite temperature data when discussing planetary temperature anomaly and there is a reason that Woods for Trees has dropped the UAH global satellite anomaly from their data base making it more difficult to compare satellite data to the HadCRUT and GISS adjusted temperature data sets. It is interesting that the change from HadCRUT3 to HadCRUT4 raises the HadCRUT temperature data to match GISS. Does anyone remember climategate? The following is a link to the UAH global temperature anomaly 1979 to April, 2013. Does that graph look the same as the GISS global temperature anomaly? It does not why? Not only is the GISS temperature global temperature anomaly roughly 0.3C higher than UAH for current anomaly, GISS is adjusted from time to time (reducing past temperatures and increase current temperatures) without explanation. Part of the reason the GISS temperature data set is higher than the UAH satellite data set is the urban heat effect. A second explanation is that the temperature stations used to ‘create’ the graph have been selected to increase the anomaly. A third reason is it appears based on the climategate emails and the unexplained recent ‘adjustments’ to the global temperature anomaly (see links below) there are senior scientists who will adjust data and analysis and/or will cover up the adjustments to support the ‘message’. The following is an abbreviated summary of the continual GISS hi-jinks. Very funny as the adjusted data is the basis for billions of dollars of spending on green scams. It is alleged that the GISS data set originally had 6000 temperature monitoring points. The base temperature was used the original 6000 temperature monitoring points. The current published GISS planetary temperature only uses 1000 points. The points used appear to be points that are warmer. (The colder high altitude points and the high latitude points have been removed. In addition an algorithm is alleged to be used that “homogenizes”. The effect of the “homogenizing algorithm is to raise the temperature. GISS data manipulation might explain why the GISS data does not correlate with satellite measurement of planetary temperature. Most of the warming in the global data analyses is in higher latitude areas like Russia and Canada and in higher mountainous regions. These areas have seen significant dropout of stations. The warming comes from interpolations from regions further south, at lower elevations and more urbanized. * Moscow-based Institute of Economic Analysis (IEA) issued a report claiming that the Hadley Center for Climate Change had probably tampered with Russian climate data. Analysts say Russian meteorological stations cover most of the country’s territory and that the Hadley Center had used data from only 25% of such stations in its reports so over 40% of Russian territory was not included in global temperature calculations. The data of stations located in areas not used in the Hadley Climate Research Unit Temperature UK (HadCRUT) often does not show any substantial warming in the late 20th century and the early 21st century. * In Canada the number of stations dropped from 600 to 35 in 2009. The percentage of stations in the lower elevations (below 300 feet) tripled and those at higher elevations above 3000 feet were reduced in half. Canada’s semi-permanent depicted warmth comes from interpolating from more southerly locations to fill northerly vacant grid boxes, even as a pure average of the available stations shows a COOLING. Just 1 thermometer remains for everything north of latitude 65N – that station is Eureka. Eureka according to …. 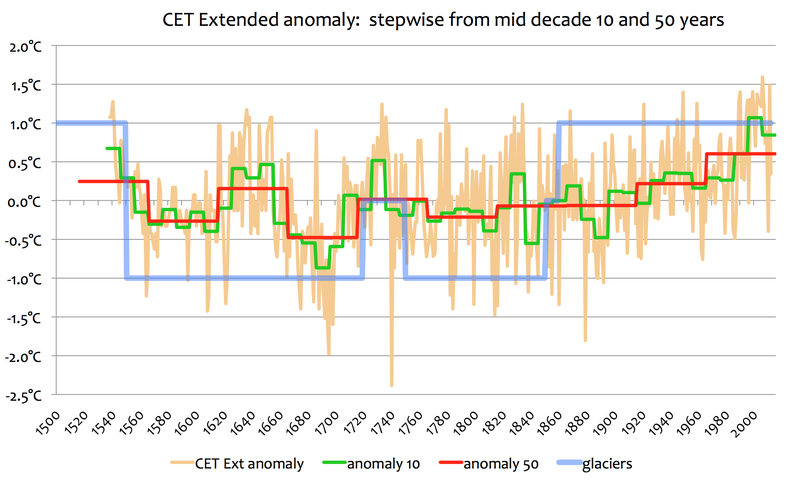 This paper notes before the 10 years of adjustments to the GISS global temperature anomaly there were statistically unexplained differences between the satellite temperature global anomaly and the GISS and HadCRUT temperature data. select points to enable a stepwise representation means practically nothing.None of the global warming models have ever postulated a stepwise warming trend. Is there a chart anywhere that compares what alarmists were claiming the climate would go to and what it actually did? This analysis by Steve McIntyre confirms that has been 0.3C adjustments to the GISS temperature data to increase the global temperature anomaly. It appears that is the reason why the UAH satellite global temperature anomaly is roughly 0.3C lower than the GISS global temperature anomaly. This reference provides more details concerning how the GISS global temperature anomaly was manipulated. My bigger concern is why Hadcrut3 and 4 have not published their April anomalies yet. The other problem with The Escalator from “Skeptical Science is that each step in it has been caused by an El Nino. Now, with PDO switched to its negative phase, steps will become smaller and less frequent with perhaps even cooling in between. This is what happens because Mann can no longer produce a robust Hockey Stick. Maybe Hansen can give him some of his special Climate Viagra. Then Mann too will be Rocketing off the charts. Maybe then Mann can make Pachauri happy again. Not sure what you mean. WFT still carries UAH. But, it is tropospheric, not surface. The Woods for Tree UAH data is is lower tropical not global mean. The majority of the 20th century temperature rise was high northern latitude. The full set of UAH data is global mean, tropical, Northern hemisphere, and Southern Hemisphere. The manipulation of the GISS data is the reason why it does not match UAH. HadCRUT4 has been adjusted from HadCRUT3 to make it match with the GISS adjusted. Here’s my take on the Marcott et al plot as reworked by Tamino. And what happens to the escalator if you take Hansen and Jones away from the data !! Do we end up in the basement ?? there is a reason that Woods for Trees has dropped the UAH global satellite anomaly …….. The Woods for Tree UAH data is is lower tropical not global mean. WFT did not drop anything that was there before although for a short period it was not updated after a new version came out several months ago. But I believe you are mixing up two words that sound almost the same but which mean very different things. WFT shows the “lower tropospheric temperature”, not the “lower tropical temperature.” WFT just shows “trop.” which does not help either. While tallbloke mentions Marcott it reminds me of this Marcott-unrobust blip-extrapolation by Joe Romm. So we can say that, yes, that is indeed how alarmists see it. I have shown this link to an alarmist guinea pig and he confirmed it. Please request a higher resolution graph at thinkprogress; I also have no idea why Joe Romms extrapolation is not exactly linear, but I’m sure he can help any interested party out there; he has written books about our very warm and megadroughty future so he should know what he has been doing there. The “Rocket”, what a great visual! there is a reason that Woods for Trees has dropped the UAH global satellite anomaly ……. The GISS and HadCRUT4 data sets were manipulated and adjusted to push an agenda. If there is no extreme AGW problem, the CO2 increases are unequivocally beneficial to the environment. The UAH data was been limited to the tropical region as the UAH tropical data agrees with the GISS and the HadCRUT2 for the tropical region. There has been no significant net warming in that region. The majority of the 20th century warming has been in high latitude regions of the northern hemisphere. The AGW theory predicted that the majority of the warming would be in tropics rather than in high latitude northern regions. The pattern of the 20th century warming does not match the AGW theory. That is fact. Facts do not change if due hiding of the data. Facts have implications as to what theory is or is not correct. I would assume that the full UAH data set (Global anomaly, tropic region anomaly, Northern hemisphere anomaly, and Southern Hemisphere anomaly) has not been included in the Woods for Trees data set, as that would enable a person to easily identify the manipulation of data to push an agenda. The data for the tropics according to UAH for January to April, 2013 is as follows: 0.371, 0.168, 0.226 and 0.168. The data for the globe according to UAH for January to April, 2013 is as follows: 0.504, 0.175, 0.183 and 0.103. The data for the globe according to what WFT records for UAH for January to April, 2013 is as follows: 0.504, 0.175, 0.183 and 0.103. Do not blame WFT for anything! He is doing an excellent job! Your comment is correct. The WFT data is lower tropospheric UAH global mean. The following is a comparison of the GISS adjusted, HadCRUT 4 adjusted, and UAH global mean. The issue is the adjustments to calculate the GISS global mean and HadCRUT4 global mean and the urban heat effect which the UAH data set does not have. 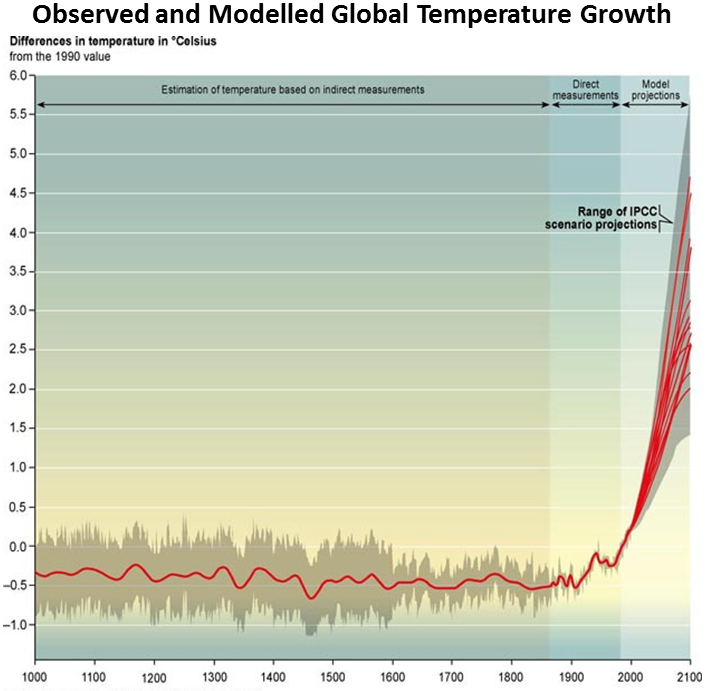 Well, the graph above is from the IPCC TAR. The actual projections from that can be found here. 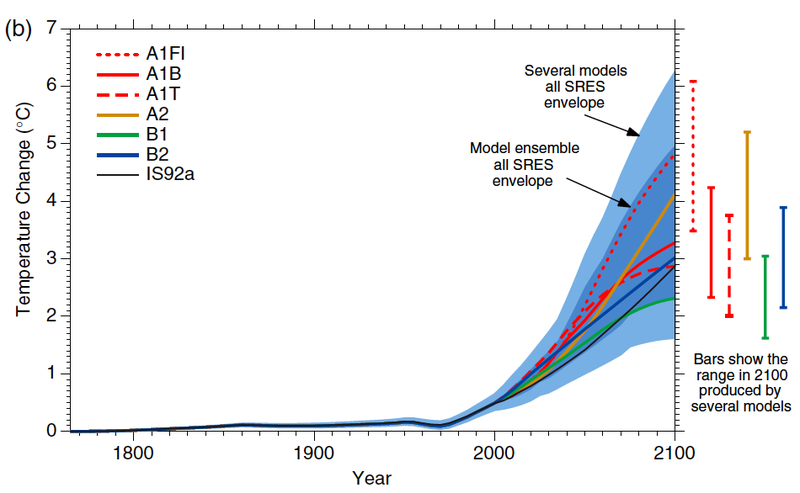 Estimated rise 1990-2010 for the closest actual scenario (A2) was 0.16 C/decade. 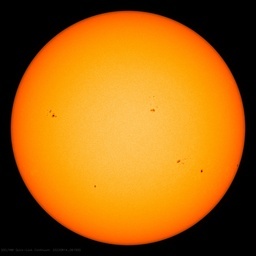 Observed was 0.15 ± 0.08°C/decade. I have added slope lines to your graph and offset the UAH by 0.34 to clearly show the difference in slope for all three. Note that UAH has a lower slope than the other two. The one thing that struck me about “The Escalator” is it shows that there is at least one person at SkS that sees the truth: that a top “step” is there, and it shows a slightly negative slope since about 2003. So maybe someone from there can stop by and answer a question: will the length (and direction) of the top step continue to increase, or will they see a need to add a new top step? Because if you overlay the two parts of THEIR chart (the step vs. the slope), you’ll see that their lines have been diverging since about 2009 (slightly decreasing “top step” vs. increasing “slope”). If they admit to a pause they are admitted to the science being junk standard. If instead of S= U T + 1 / 2 A T squared you used 1 / 4 AT squared you get the right answer after a pause but no one in their right mind would consider the science right still. Why is climate science subject to such different rules to what we are used to thinking of as real science? The US alone spends $7 billion each year on warming “studies”, which is, in truth, nothing but a huge money laundering operation, as no real science is conducted and vapid alarmist reports the only product generated.